Global market tides have swept rupee close to an all-time low, raising current account financing and inflation risks, but for now policymakers are more likely to use small-scale intervention and administrative measures to defend the currency. While the Reserve Bank Of India and the government are tightening gold import norms, industry said on Tuesday that curbing supply may have a short term benefit but demand will be met by the unauthorized grey market. Paris, June 4 France must lower labour costs, open up regulated professions, deepen its labour and business reforms and cease tax hikes to get back to growth and bolster competitiveness, the IMF said on Tuesday. The government is likely to raise the cap on foreign institutional investment in government debt by US $5 billion soon, two finance ministry officials said on Tuesday, to support the sliding rupee and fund a widening current account deficit. Haryana Chief Minister Bhupinder Singh Hooda said Tuesday the state government is preparing a “Master Development Plan-2031” for Faridabad and assured industry all its present problems will be addressed by it. The Enforcement Directorate has slapped a show cause notice on real estate developer Emaar MGF to the tune of a massive Rs 8600 crore for violation of foreign exchange norms. Telecommunications carrier Bharti Airtel has submitted its final bid for a telecoms licence in Myanmar, a company spokesman told Reuters on Tuesday. The rupee fell 4.8% last month, and was the worst performing Asian currency as the dollar rallied broadly on speculation that the Federal Reserve will begin reducing its monetary stimulus later this year. 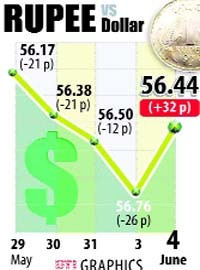 Trading at 56.65 per dollar on Tuesday, the rupee is not far from a record low of 57.32 hit on June 22, 2012. Having a currency at an all-time low is not a great advertisement for the government's management of the economy ahead of important state elections due in coming months and a national election due within a year. It will also fuel inflation, make it more difficult to fund a current account deficit that was equivalent to a record 6.7% of GDP in December, and drive up the cost of oil and gold imports that respectively account for 35% and 11% of India's trade bill. Further global dollar strength and investor risk aversion could spell danger if it leads to continued rupee weakness, and India's external deficits worsen. "Foreign investors may start fleeing Indian markets on escalating balance of payments risks," said Priyanka Kishore, a currency strategist for Standard Chartered in Mumbai. Sentiment for the rupee has turned the most bearish since November, according to a recent Reuters poll. 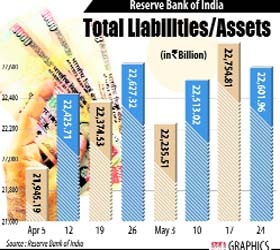 Having attracted around $50 billion in inflows since the start of 2012, the rupee is rendered particularly vulnerable to a withdrawal of foreign funds. The response of the World Gold Council (WGC) came as new restrictions on gold imports are kicking in. The RBI today extended the restrictions on gold imports to other agencies in addition to banks, a move aimed at curtailing demand for the precious metal for domestic use. The commerce secretary also said Tuesday the government is mulling measures to curb imports of gold. The RBI also said all letters of credit (LCs) to be opened by nominated banks and agencies for import of gold “under all categories will be only on 100 per cent cash margin basis”. The restrictions will, however, not apply to import of gold to meet the needs of exporters of gold jewellery. 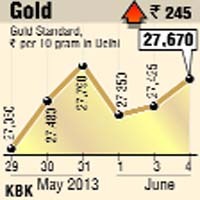 The government and the RBI have been taking steps to reduce gold import. High import has widened the CAD, with such deficit hitting a record high of 6.7% of GDP in the third quarter of 2012-13. The import of the yellow metal during the first two months of the current fiscal are estimated at US $15 billion. Somasundaram PR, managing director, India, World Gold Council said demand for gold, whether in the form of jewellery or investment (bars and coins), is driven by millions of individuals investing as part of their household savings. He added people buy gold as a long term investment to protect their wealth and gold also has huge significance socially, emotionally and economically in India. Addressing this demand by curbing supply may have a short term benefit but this demand will be met by the unauthorized grey market and this will not be positive for either the economy or for society, he added. The WGC said while recognizing the immediate imperative, incremental, short term measures that do not address the underlying issues will result in negative unintended consequences. India is a significant stakeholder in the gold market with over 20,000 tonnes in the hands of millions of people”. Reuters adds: India imported around 162 tonnes of gold in May, a finance ministry spokesman said on Monday, much more than expected and making further measures from the government to curb demand in the world's biggest bullion buyer almost certain. The figure is sharply higher than April, even though it is below an estimate of 262 tonnes earlier in the day from Finance Minister P. Chidambaram which had stunned experts, including the World Gold Council and the Bombay Bullion Association. The government hiked its import duty to 6% in January in an attempt to limit purchases and rein in a record high current account deficit. Gold is the second biggest import item after crude oil. France must lower labour costs, open up regulated professions, deepen its labour and business reforms and cease tax hikes to get back to growth and bolster competitiveness, the IMF said on Tuesday. A day after slashing its growth forecast for Germany, the International Monetary Fund said that France was set to contract slightly more than its current forecast and that unemployment would keep rising in spite of the government's promise to reverse the jobless trend by year-end. "The number of reforms initiated in the last six months speak well of the government's understanding that France needs to be reformed," the IMF's mission chief for France, Edward Gardner, said, adding: "It's a first step in a long process." The Fund urged France to remove constraints on housing construction and push for more negotiations at enterprise level. It also suggested giving the competition authority more power to review all sectors of the economy and push to remove regulatory obstacles. With rising youth unemployment a growing concern throughout Europe, the Fund said more instruments should be found to lower the effective cost of hiring young workers. The rupee fell 4.8% in May, and the current account deficit widened to 6.7% of GDP in the December quarter, mainly driven by crude oil and gold imports and subdued exports. "The file has been sent to the finance minister for signing, and once it comes back, the decision could be announced anytime," one finance ministry official, who did not wish to be named, said. He said the government also planned to relax rules for FIIs' to invest in India by month-end, by easing registration norms, known as " Know Your Customer" rules. 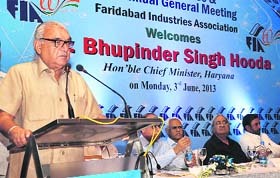 Hooda, who was addressing industrialists at the 60th AGM of the Faridabad Industries Association, which is celebrating its diamond jubilee this year, at Surjakund near here on Monday, said his government had accomplished several projects in Faridabad during the past eight years and more were in the pipeline. He cited extension of Delhi Metro to Ballabgarh in Faridabad, six-laning of national highway-2 passing through Faridabad, completion of Badarpur flyover, Industrial Model Township and construction of the Faridabad-Gurgaon and Ballabgarh-Sohna roads. In the past eight years projects worth Rs 849 have been either commissioned or are in progress in Faridabad. About 10 new wells will become functional by end of this year which will take care of water needs of the city for the next 15 years. Hooda reiterated that Rs 2,679 crore had been allocated to Faridabad under the JNNURM scheme. According to him, during the past eight years of his regime the government had spent Rs 3,925 crore on development works in Faridabad. He said while the planned budget of Haryana in 2005 when he assumed charge was Rs 2, 300 crore only, it had gone up to the tune of Rs 26,000 crore this year. The company has been charged with violation of the Foreign Exchange Management Act (FEMA) by buying agriculture land although it had been allowed infusion of foreign investment for construction purposes. The ED in an investigation, under FEMA in the case of Emaar MGF, noticed funds were received by this company and its 4 subsidiaries from Dubai, Cyprus, Mauritius and other foreign countries under the RBI’s FDI scheme since April 2005 to the tune of Rs 8,600 crore. This RBI scheme has given facility to Indian companies under automatic route to receive funds from abroad for a number of business activities including the construction of development projects. In this hassle free facility, Emaar MGF Land and its subsidiaries had to disclose the purpose(from the list of permitted activities by the RBI) for which foreign direct investment was received. This company and subsidiaries disclosed the use of FDI in construction development projects, but utilized the overseas funds in the purchase of agricultural lands in India and thus have utilized the overseas funds in the business neither disclosed to the RBI nor permitted in the bank’s FDI scheme. According to sources close to the ED, investigation under FEMA has revealed foreign investments received by the companies were utilized in the purchase of agricultural land through various methods either directly or through other associated companies by diverting overseas funds to them. Telecommunications carrier Bharti Airtel has submitted its final bid for a telecoms licence in Myanmar, a company spokesman told Reuters on Tuesday. Myanmar, one of the world's last major untapped mobile markets, has called bids for two mobile licences and shortlisted 12 international consortia.